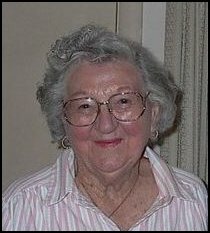 Betty Flaherty, age 90, widow of the late Charles Flaherty, passed away peacefully in her sleep in San Diego on October 16th after a long illness. She was born on Dec. 24th, 1921 in Cleveland, ND, daughter of Fred Siegle and Katherine Berg. Betty was preceded in death by her beloved husband, Chuck, and her sisters Nettie, Peggy and Clara. Betty & Chuck were married in Jamestown, ND on July 24, 1943 while Chuck served in the Army. After his discharge in 1945 they settled in Jamestown. In 1956 they moved to Sacramento. They were actively involved in their church, Trinity United Methodist, for nearly 50 years. They traveled extensively after Chuck's retirement from International Harvester. She is survived by their daughter, Charlene, grand daughters Michele and Nicole, great granddaughter Catherine, 2 step great grandchildren, Kyla and Brendan all of San Diego, and a sister, Jean Vrieze of Rochester, MN as well as numerous nieces and nephews. Betty will be interred with her husband at Lodi Memorial Park. In lieu of flowers, donations can be made in her memory at Trinity Church, 2245 Highridge Drive, Sacramento, CA 95825.